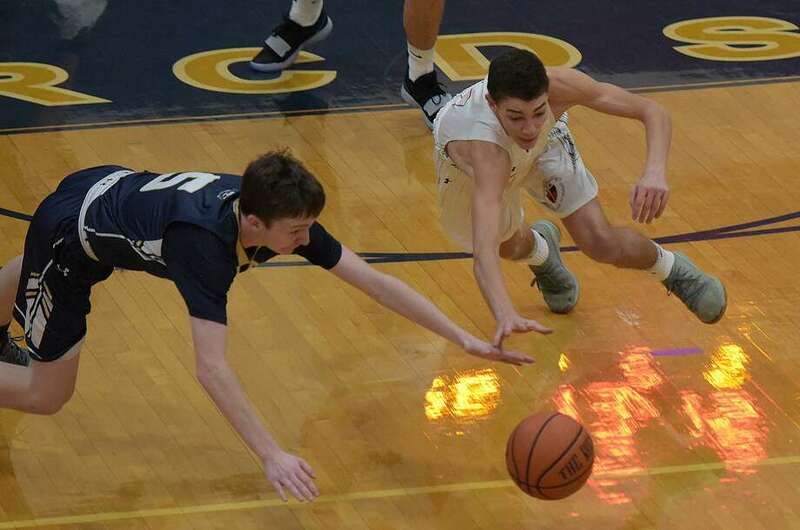 GFA boys basketball player David Basich, right, hits the floor to come up with a loose ball during a road game at Rye Country Day last week. The Greens Farms Academy boys basketball team hasn’t played a home game since Dec. 18. That day, however, was the start of a six-game win streak by the Dragons, who capped off the five-game road trip with a pair of wins last week. Cole Prowitt-Smith (Fairfield) tossed in 18 points and TJ Holloway (Orange) added 17 more as the Dragons won their fifth straight game with an 84-43 win over Masters in Dobbs Ferry, N.Y.
David Basich (Westport) and Greg Lawrence (Fairfield) added 11 points each for GFA. Lawrence added 12 rebounds and eight blocks. Jack Seegers (Stamford) chipped in with eight points. Later in the week, GFA put four players in double figures, racing out to an early lead and holding off Rye Country Day on the road on Friday night. Prowitt-Smith and Lawrence scored 15 and 14 points, respectively, to lead the effort while Holloway had 12 and Jack Ramsay (Darien) added 11 more. Lawrence had 15 rebounds in the game while Prowitt-Smith had eight assists and five boards. Ramsay chipped in with seven rebounds. Alden Grover (Greenwich) and Santi Mejia (Bridgeport) earned their first varsity victories, with pins, to lead Greens Farms Academy to a dual meet victory over Pomfret. Grover (wrestling at 126) won at a pin in 3:50 while Mejia (132) took a pin right at the end of the first period. Other winners for GFA were Mikey Bartush of Norwalk (152, pin 1:25), Adler Viton of Darien (195, pin 3:19), Nico Provo of Stratord (113, pin 1:30), and Peter Kane of Fairfield (138, pin :23). Katherine Marcus (New Canaan) and Georgia Grabowski (Stratford) combined to score 43 of their teams 58 points as the Dragons won their second straight game with a 58-44 win over Millbrook. Marcus scored 23 points while Grabowski added 20 to pace the win as GFA improved to 9-4 on the season. Kristiana Modzelewski (Westport) added seven points and seven rebounds to the winning effort. Marcus also had 11 rebounds, three steals and two assists while Grabowski had five boards. Kelly van Hoesen (Greenwich) chipped in with five steals, three rebounds and two assists. The Dragons got wins at slots two through seven to notch the programs’ first win over Darien during the Attila Agh Era. Seventh grader Eddie Xue (Westport), playing at No. 2, won a five-set thriller 2-11, 11-6, 10-12, 11-7, 11-7 while Giani Panariello (Westport) went the distance at No. 3, taking a 9-11, 11-9, 11-4, 6-11, 14-12 win. Marshell Bessey of Darien (11-3, 11-2, 11-7), Will Mackle of New Canaan (15-13, 11-8, 11-8), Patrick Howard of New Canaan (7-11, 11-5, 11-9, 11-5) and Luke Hammer of Darien (11-5, 11-5, 11-3) also earned points, as well. Clare Foley (Southport) notched a win out of the No. 1 slot helped spark GFA to a 5-2 win over King. Foley won her match 12-10, 12-10, 11-5. Anya Bettegowda (Wilton) won 11-6, 11-0, 11-3; Annabelle Kreitler (Fairfield) was victorious 11-4, 11-3, 11-1; Keely O’Shea (Darien) won 11-0, 11-3, 11-0; and Charlotte Cohen (Westport) won by an 11-2, 11-0, 11-0 score. The lower part of the line-up was victorious for the Dragons, which topped Masters by a 5-2 count on Thursday. O’Shea took four sets to win in 11-4, 6-11, 11-7, 11-5 while Mary Kessler (Westport) won 11-8, 11-7, 11-5; Bettegowda won 11-0, 11-1, 11-2; Kreitler won 11-4, 11-2 (last set not recorded), and Cohen won 12-10, 11-7, 11-0.